The company today launched a firmware update to fix this problem. Neither the contrast-based focus system nor the Live View mode or optical stabilizer of Sigma’s lenses work correctly when used with the Nikon D5300. The Japanese company has not specified if this is a widespread problem or if it only affects certain lenses. 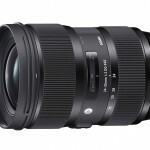 In any case, Sigma has already promised a firmware update that will be available today and promises to correct these errors. For discontinued lenses, the users will have to contact the company, although they have warned that in some cases they won’t be able to fix this problem.